Woodend War Memorial commemorates those who served in World War One. 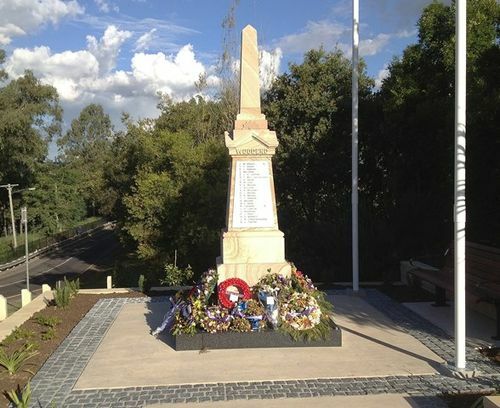 The memorial was constructed under the auspices of the Woodend Progress Assocation who had originally aimed for an honour board, but with the success of their fund raising were able to arrange the stone memorial. It was unveiled on 29 March 1919 by the Mayoress, Mrs E.J.L. Easton. The memorial was extensively damaged by a drunk driver in 2012. Funds were received in 2013 to restore, refurbish and upgrade the memorial. Last Saturday and Sunday were described by the Mayor (Ald. E.J. L. Easton) as a "soldiers week-end." Saturday was fully occupied in the big meeting held in the centre of the city in the morning, and the function in connection with the unveiling of the Woodend Honour Stone filled in the afternoon. The Woodend Progress Association under whose auspices the honour stone has been erected, was fortunate in having had an excellent advertisement given their function during the morning. A number of metropolitan returned men availed themselves of the opportunity of attending the ceremony. The procession was headed by the Ipswich Model Band, under Conductor H. J. Harper, which combination subsequently assisted with selections. Capt. Chaplain T.Hely-Wilson, and Lieuts. J. H. McKenzie and C. C. Allen were in charge, some 220 returned men taking part in the parade. A batch of members of the Ipswich Navy and Army Veterans' Association and the Rejected Volunteers' Association also participated. The unveiling ceremony was performed by the Mayoress. She expressed thanks for the honour accorded to her in asking her to unveil the stone. The honour stone is an artistic piece of work. It is cut from material procured from Murphy's Creek and stands on a three-tier concrete foundation, There are 74 names on the roll. The stone is surmounted by an obelisk, and the ornamentations include an artistic representation of the rising star. Excerpt from Queensland Times (Ipswich) (Qld), 31 March 1919.